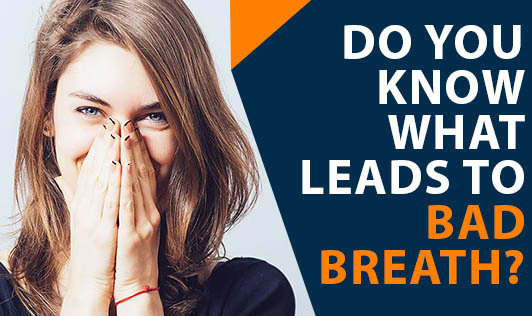 Do you know what leads to Bad breath? Bad breath is the common name for the medical condition known as halitosis. Many a times you could have a bad breath and not know about it, as it is difficult to rate your own breath, and this can be embarrassing. Bad breath odors vary depending on the source or the underlying cause. Bad breath can be caused by a variety of reasons including diet, medication, poor oral hygiene, and certain diseases or health conditions. Treatment for bad breath depends on the cause. Let us discuss in brief, how bad breath is caused. • Food: The breakdown of food particles in and around your teeth can cause a foul odor. In addition, food particles over time can promote the growth of bacteria, which can also cause foul odors. Onions and garlic are the best-known examples of foods that contribute to bad breath. After digestion of the foods, certain odour causing substances from the food reaches the lungs through the blood stream, causing noticeable odors when exhaled. ‘Low carb' diets also lead to a fruity odour, as the body burns fat as its energy source and gives fruity-odoured ketones as end-product. • Dental problems: Poor dental hygiene and periodontal disease like gum or periodontal infection can be a source of bad breath. If you don't brush and floss daily, food particles remain in your mouth, collecting bacteria that can emit chemicals leading to bad breath. • Dentures or Dental Appliances: Dentures or dental appliances, such as braces, can contribute to bad breath. Most often it is due to food particles that are not properly cleansed from the appliances. If the dentures are loose-fitting, it can contribute to sores and localized infections in the mouth, which can cause bad breath. • Dry mouth: Bad breath can also be caused by decreased flow of saliva. Saliva helps cleanse your mouth, removing particles that may cause bad odors. A condition called dry mouth caused by some medications, breathing through the mouth, or salivary gland problems can contribute to bad breath. • Morning Breath: Overnight, bacteria accumulate in the mouth, causing bad breath that is commonly referred to as 'morning breath'. People, who breathe through their mouth at night, can suffer from dry mouth which can worsen morning breath. • Medical disorders: In about 10 percent of bad breath cases, the bad odors do not come from the mouth. It is caused due to certain illnesses, such as cancer, metabolic disorders, kidney or liver failure, uncontrolled diabetes, chronic reflux of stomach acids (GERD), local infection in the respiratory tract, chronic sinusitis and/or post-nasal drip, chronic bronchitis, throat infection (pharyngitis or tonsillitis), ulcers in the respiratory system and lactose intolerance . • Tobacco products: Smoking dries out your mouth and causes its own unpleasant mouth odor. Tobacco users are also more likely to have periodontal disease, an additional source of bad breath. In addition to causing bad breath, smoking or chewing tobacco-based products can stain teeth, irritate gum tissue, and exacerbate tooth decay.